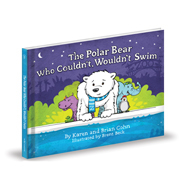 The Polar Bear Who Couldn’t, Wouldn’t Swim follows the journey of a young polar bear named Zeke who is afraid of the water and refuses to swim. He leaves his home in search of other animals who do not swim, and ends up finding that he can enjoy the water if he follows the ABC and Ds of water safety, while learning a valuable lesson about facing his fears with a positive attitude. · D is for Drains: pool drains are dangerous to swimmers, and should be avoided while swimming.